1810 The business was founded by John Spencer, who made files using water power in a mill previously used for corn. 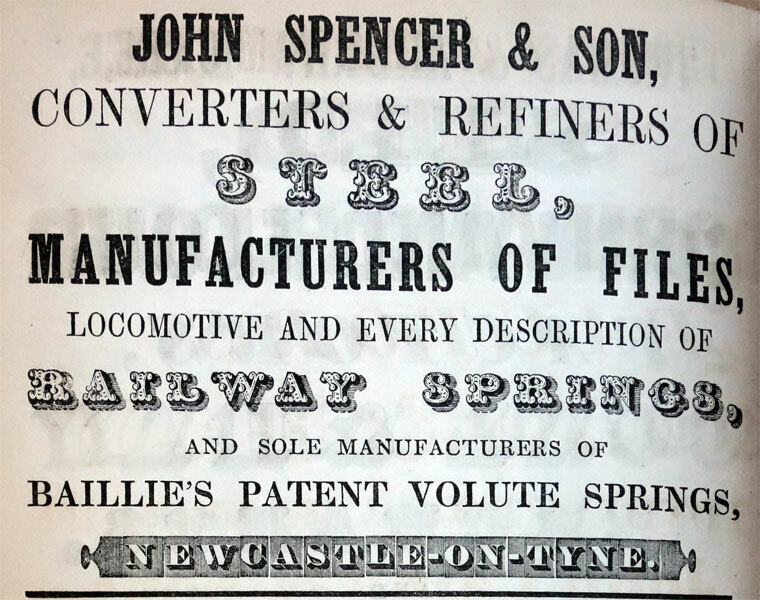 Spencer & Sons, otherwise known as Spencer's steel­works, operated for 119 years and supplied all the original requirements of Robert Stephenson and Hawthorns for the construction of the early rail locomotives and later supplied many of the shipyards. 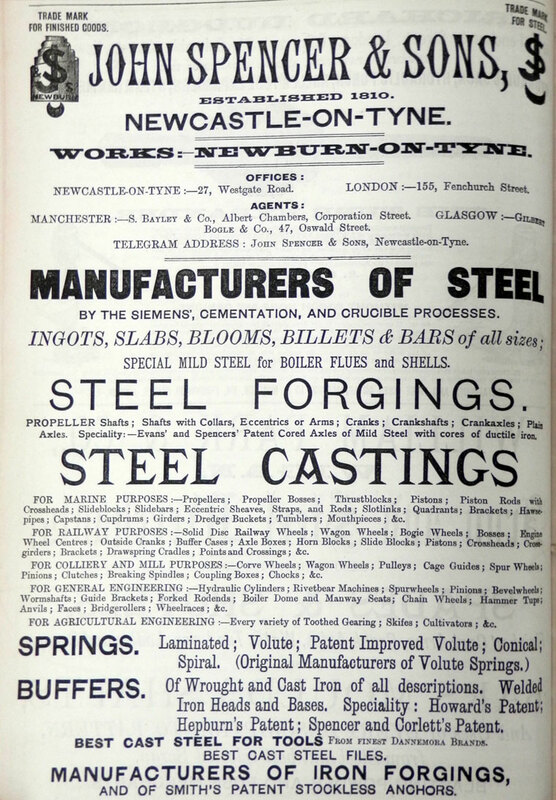 1847 The original manufacturer of volute springs for railway use under Baillie's patent. 1851 Award at the 1851 Great Exhibition. See details at 1851 Great Exhibition: Reports of the Juries: Class V.
1867 Founder John Spencer died. Business taken over by his three sons: John Spencer, Michael Spencer and Thomas Spencer. 1912 (Advert)London Office Victoria Mansions, 32 Victoria Street, London S.W. 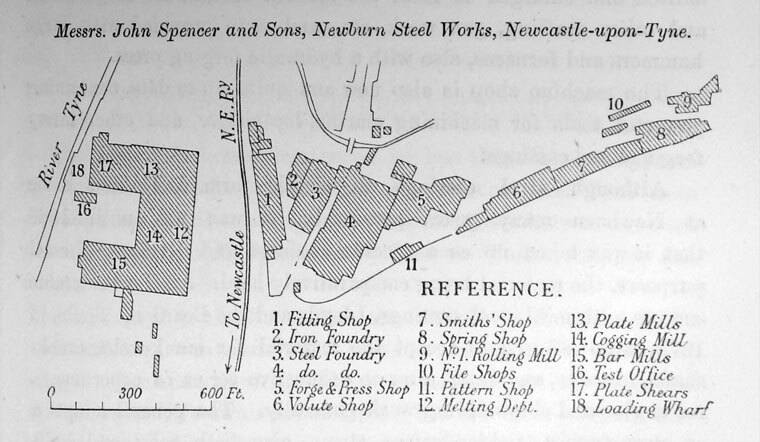 In the decline of the 1900s, Spencer's steelworks faced a battle for survival and were eventually forced into volun­tary liquidation in 1924 with the loss of 2,000 jobs. 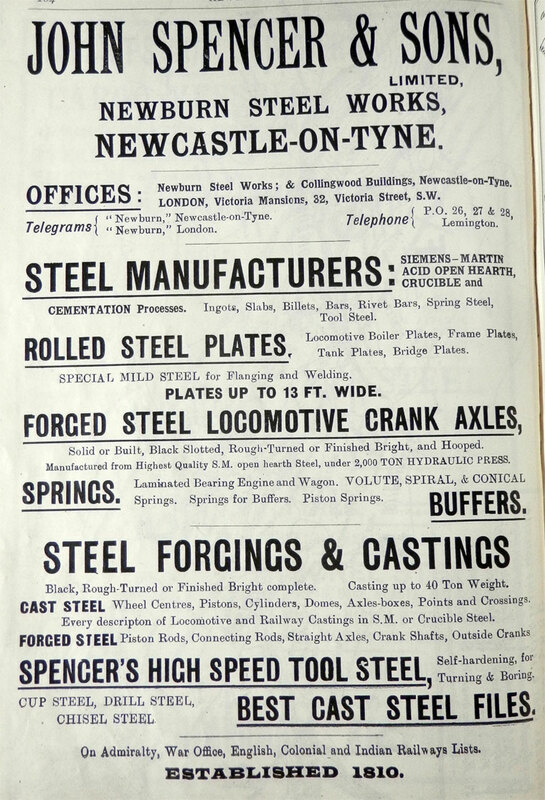 The rolling mills were dismantled and sold to a Sheffield firm but the manufacture of forgings, castings, railway wagon springs, etc continued at Newburn. This page was last edited on 11 April 2018, at 10:38.